Join us on Wednesday, April 10th 2019 at American Shooting Centers, 16500 Westheimer Parkway, Houston, TX 77082. 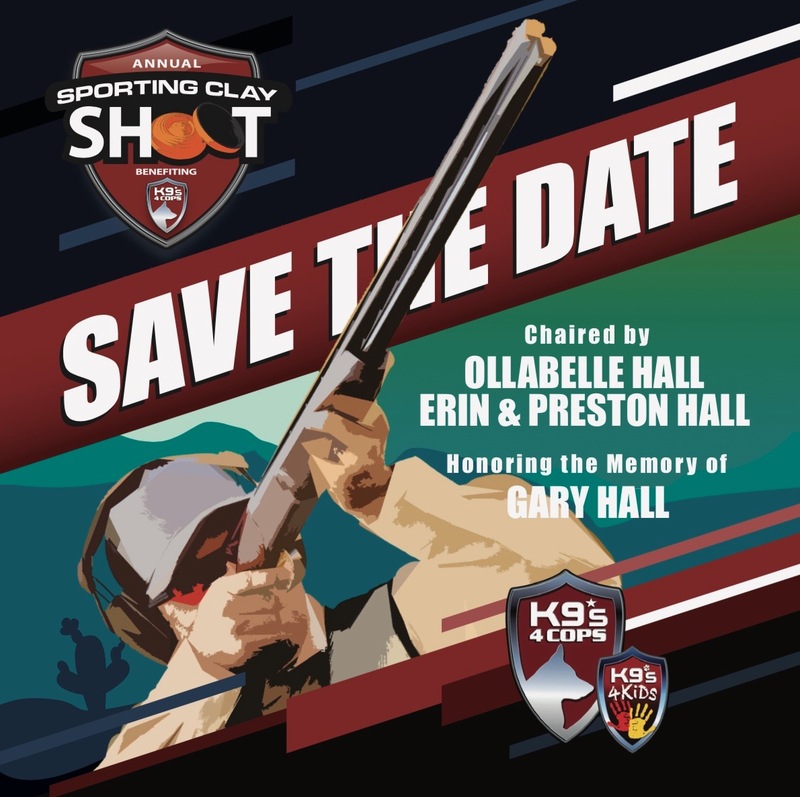 Lunch, Competitive Shooting, Auction, Awards & K9 Demo. Kristi Schiller says the story stopped her cold. Watching a news broadcast about a grief-stricken Houston-area deputy who lost his K9 partner during a struggle with a suspect, the reporter mentioned there wasn’t enough money to give the officer a replacement pup. A self-described lover of both dogs and law enforcement, Schiller dug into her own pocket to pay for a new K9 partner for the deputy. That was four years and sixty dogs ago. Police K9’s do important work, no one disputes that, but many police and sheriff’s departments are cash crunched and have been forced to cut K9s from the budget. The highly trained dogs can cost upwards of $15,000, just for the initial purchase. Schiller saw a need and vowed to fill it. 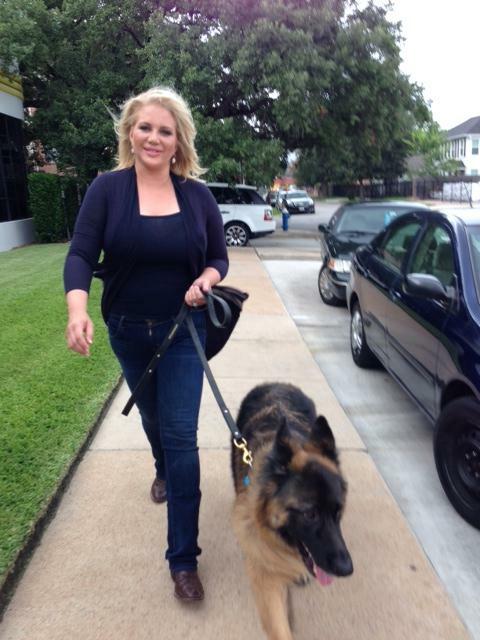 She started K9s4COPS, a non-profit organization that buys and trains the dogs and then gives them away to law enforcement officers. Her first fundraiser was in her backyard. She began knocking on corporate doors all over Texas, asking for donations. “Kristi Schiller is not a gal you say no to,” says a friend who became a supporter. Any law enforcement agency can apply and Schiller has enlisted a handful of deputies and police officers who review the applications once a quarter and make recommendations. Those who receive good news travel to Houston to choose and train with their K9 partner before returning home as a team. Schiller’s dogs are now fighting crime in 17 states. Pasadena, Texas Police Office Mark Brinker received his K9 partner, Austin, in January. “It would be a whole different show without him,” Brinker says. Instead, she wants to tell you about her next challenge, giving dogs to schools. The mom of a young daughter, Schiller has launched K9s4KIDS and has given away six so far to promote what she calls a safe learning environment. KHOU 11’s Courtney Perna visits the K9s 4 Cops organization, a non-profit providing law enforcement agencies, school districts and college campus police departments with K9s trained and ready for action. Watch the video. The tragic story of a police K9 lost in the line of duty inspired the founding of an organization dedicated to improving the effectiveness of law enforcement and ensuring public safety. Harris County Precinct 4 Deputy Ted Dahlin spent more than three years building up an intense level of trust with his partner. The two had gone through rigorous training together, and out on patrol, Dahlin was secure in the knowledge that his partner would lay down his life to protect Dahlin’s if necessary, without question and without hesitation. That’s what partners do—particularly, partners of the four-legged variety. In the late afternoon hours of Dec. 22, 2009, Dahlin and his K9 partner, a 5-year-old Czech-German shepherd named Blek, responded to a burglary call. It was the last call Dahlin and Blek would ever work together. Two burglary suspects, surprised by the arrival of uniformed officers, had fled into a wooded area of north Houston. Blek went in after them, just as he was trained to do, but he didn’t come out. One of the burglary suspects, a 17-year-old named Cornelious Harrell, strangled Blek to death. Dahlin had lost his partner and his friend. “That night was very hard,” Dahlin remembers. “I spent more time with Blek than I did my family. When I lost him, it kind of took the wind out of my sails. “Really, all I wanted after that night was to see something good come from that horrible incident.” And in fact, something good would come from it. Learning of Dahlin’s loss and Blek’s sacrifice while watching the evening news, Houston-area philanthropist and animal lover Kristi Schiller was moved to act. She called a local politician she knew and inquired about donating a new K9 to the Harris County Precinct 4 Constable’s Office. Her generous request was met with little more than questions and bureaucratic red tape. “I quickly found it wasn’t as easy to donate a dog as I thought it would be,” Schiller says. Next, Schiller took to the Internet in search of some sort of charitable organization that could cut through the red tape and help her fulfill her wish of donating a K9. Again, she came up empty, but she did learn through her Internet search that more than a dozen law enforcement agencies, just in her home state of Texas, were in the process of trying to acquire K9s. She also learned that a trained K9 carried an initial price tag of between $10,000 and $15,0000, and that K9 unit budgets were often the first casualty of rough economic times within a police department. In June 2010, Schiller founded K9s4COPs with the mission of raising charitable funds to acquire and donate trained K9s to law enforcement agencies in need. On March 27, 2011, the organization received its 501 (c)(3) non-profit status, and less than a month later, K9s4COPs made its first donation to the Harris County (Texas) Sheriff’s Department: four K9s named Boomer, Fozzie, Mikey and Tamara. Since then, K9s4COPs has grown exponentially. In 2011, the organization donated 10 K9s to two agencies in Texas. In 2012, the tally was 13 K9s to nine agencies in three states. So far this year, K9s4COPs has gifted 19 K9s to 15 agencies in seven different states, and in just over two years since its inception has raised more than $2 million to support the cause. The Harris County Sheriff’s Department, recipient of K9s4COPs’ first-ever gift, has since received 16 K9s from the organization, bringing the department K9 unit’s roster to 23 K9s. Sgt. Mike Thomas has been with the Harris County Sheriff’s Department since 1985 and has spent the last 22 years working with the K9 unit. 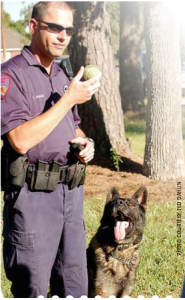 He’s worked his way from the bottom up— starting out as a bite-suit-wearing decoy during K9 training sessions and now serving as day- shift sergeant as well as training sergeant—and he’s seen the unit grow. Thanks to K9s4COPs, he says, the department’s K9 unit has almost tripled in size in the time he’s worked there. The addition of all those well-trained dogs has benefitted not only the department and the officers they patrol with. More importantly, it’s benefitted the community as a whole—and the benefit is quantifiable. Deputies Alex Chapa and Daniel Kerrigan are two of the Harris County Sheriff’s Department officers who have benefitted from the generosity of K9s4COPs. Both took a trip with Sgt. Thomas and other deputies to a kennel several states away to select their donated K9 partners. For Kerrigan, who had never owned a dog before and went to the kennel with no preconceived notions, the selection of Dutch shepherd Bailey, dual trained for patrol and narcotics detection, was all about the eye test. Chapa, on the other hand, had more of a predetermined idea about the qualities he would look for in a new partner. Chapa found his perfect match in Rocco, a Belgian Malinois with specialized training as a patrol K9 and in explosive detection. Both deputies agree that the K9 partners they’ve received through the generosity of K9s4COPs are helping them perform their duties better and more confidently. Kerrigan learned very early on in his career with the K9 unit that the sense of security Chapa describes can turn very real. Just out of K9 school, Kerrigan and Bailey saw their first real-world deployment when they were called with other officers to respond to a home invasion. Gunfire was exchanged, and the armed suspect fled into a wooded area. After a good deal of searching through the brush, Kerrigan and his dog located the suspect, who turned his gun on Kerrigan. That’s when Kerrigan’s K9 partner went into action, bursting toward the armed suspect, hitting him hard in the arm and knocking the gun loose. 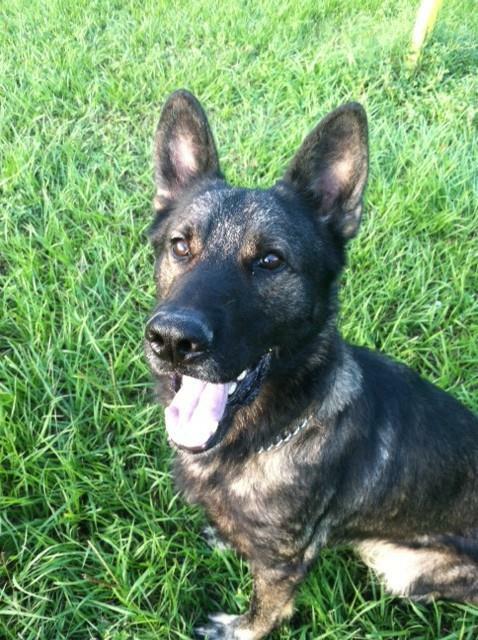 The suspect was taken into custody, and Kerrigan and his K9 lived to serve another day. Now having served with K9 Bailey for two years, Kerrigan has developed a keen appreciation for the abilities of these brave service dogs. They are valuable partners in the war on crime. Besides the physical gift of police K9s, the K9s4COPs organization is also providing a valuable service to law enforcement in the area of training. This past October, K9s4COPs hosted its first Texas K9 Officers Conference and Trials in Houston, bringing in subject matter experts from around the U.S. to share knowledge with the 75 K9 officers who attended. The officers were able to learn new techniques and gain valuable TCLEOSE (Texas Commission on Law Enforcement Officer Standards and Education) certification hours. This inaugural conference was such a success that plans are already being made for a larger conference in 2014. On the 2013 conference’s final day, 30 K9/handler teams had the opportunity to let off a little steam and put their abilities on display at the Hard Dog Fast Dog Competition at Thorne Stadium in Houston. K9 competitors were put to the test and judged on the power and strength with which they could hit a bite-suit-clad decoy (Hard Dog) and how fast they could run (Fast Dog). Fittingly, it was two well-trained K9s4COPs-donated dogs from the Harris County Sheriff’s Department that took home top honors in the competition. Alex Chapa’s partner Rocco posted a 31 mph sprint time to win Fast Dog, and Daniel Kerrigan’s partner Bailey finished off a dead run by putting a ferocious hit on a decoy to take Hard Dog honors. While the event was a lot of fun for the participants and for members of the public who gathered to cheer on the competitors, Chapa noted that the K9s4COPs Hard Dog Fast Dog Competition provided more than just entertainment value. Hard Dog and Fast Dog awards at midfield of Thorne Stadium, Kerrigan and Chapa were able to reflect on the real value of Schiller’s young organization—both to themselves personally and to the community at large. “It’s really cool that we get to work with dogs,” Kerrigan said. “But when you break it down to what it’s really accomplishing, it’s a lot bigger than just more cops with dogs. It’s safer people.